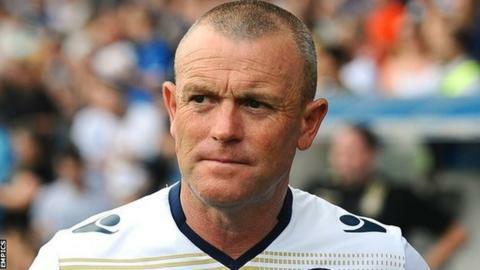 Kidderminster Harriers have named former Leeds United boss Dave Hockaday as their new head coach. The 57-year-old takes over from Gary Whild who left the National League club last month. Hockaday will be in the dugout for Saturday's game at Macclesfield, with Harriers bottom of the table, without a win, and five points from safety. "Dave has an enviable reputation as a coach within the game," said Kidderminster chairman Rod Brown. Hockaday was sacked after only six games and 70 days in charge of Championship club Leeds in August 2014. He had been a shock appointment two months earlier, with his only previous managerial experience at non-league Forest Green Rovers. Hockaday has worked for non-League Swindon Supermarine and League One Coventry City since leaving Leeds. Dave Hockaday made 519 league appearances for Blackpool, Swindon Town, Hull City, Stoke City (loan) and Shrewsbury Town, at right-back or in midfield, before retiring, aged 38, in 1995. He spent seven years at Watford from 2000 as under-18s coach, then first-team coach, until leaving in 2007, after which he worked briefly under Martin Allen at MK Dons. He had two years as Southampton youth coach, then worked again under Allen at Cheltenham before four years as Forest Green boss until October 2013.